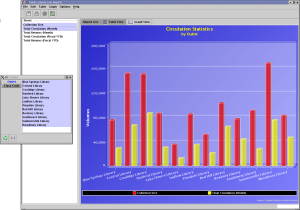 This reporting software is a data-visualization solution providing cross-vendor support. You can quickly zoom in on the information you are looking for, producing tables and graphs. Point-and-click simplicity - no query language to learn! Easily create professional looking and presentation-ready tables and graphs. Your work may be easily saved for use in web pages, documents, spreadsheets, or presentation software. Call us today at (888) 565-1412 or e-mail reports@public-library.com to arrange a demonstration. Learn how you can begin efficiently and effectively using your own information. Copyright © 1997-2012 Public-Library.com, Inc. All Rights Reserved.